Last month featured a description of the glacial beach ridge and swale habitat along Lake Huron , formed by higher lake levels roughly 4,500 years ago. This month features two developments within that habitat in Fort Gratiot Township , Saint Clair County, and the effort to balance development with preservation at each site. These are "Shorewood Forrest", and "Lake Huron Woods" retirement center. Seeing any of the habitat lost is painful, knowing how unique it is and how little is left. But, while there is always room for improvement, these are two bright spots in a decade of widespread destruction. 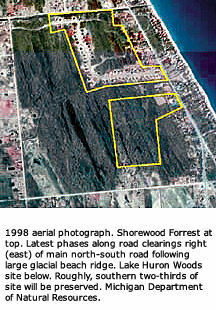 "Shorewood Forrest", a residential subdivision located along the west side of M-25, south of Brace Road, was developed by Erwin Wilton, owner of Wilton's TV and Appliance in Port Huron, along with his partner, Larry McPhedrain, owner of Mary Maxim craft store in Port Huron. Larry passed away about a year ago. From the start, Erwin Wilton and Larry McPhedrain wanted "Shorewood Forrest" to be different. They wanted to preserve as much forest as possible and avoid wetland destruction. Having lived on that land since a boy, Erwin recognized something was different about it. The name, "Shorewood Forrest", reflects his understanding of the shoreline and forest connection. Whether Erwin was an aspiring Robin Hood may be another story. Back in 1992, Erwin made sure the wetland was properly delineated, accounting for all wetland regulated by the State of Michigan . Next, he minimized wetland impacts by placing the roads on the upland beach ridges, restricting the number of wetland crossings, and configuring lots so houses would not require wetland fill. While the upland beach ridges are obviously an important part of the habitat, this was the least harmful option short of clustering. The resulting "Shorewood Forrest" development provides wooded seclusion with wide strips of forested wetlands between backyards. A small amount of upland is also included, providing nearly the full range of habitat that existed prior to development. This is important for uncommon plant species like Purple-flowering Raspberry and Yellow Lady's-slipper, featured in last month's article, that tend to grow in a moist upland zone of mucky sand along the muck wetland swales. With the emphasis on a natural setting, the values of homes in "Shorewood Forrest" are some of the highest in the county. Erwin Wilton says, "The land is ours for only a few short years. I want to be a faithful steward of what God has entrusted." Just to the south, "Lake Huron Woods" retirement village is currently being developed by Presbyterian Villages of Michigan and three area Presbyterian churches, along the west side of M-25, north of Carrigan Road. Again, the name, "Lake Huron Woods", reflects an understanding of the shoreline and forest relationship. They have been very receptive to the ecology of their land, allowing a full inventory of plant species by volunteers from the Michigan Nature Association, and incorporating alternative site plan layouts to preserve both wetland and upland areas. As a result, "Lake Huron Woods" will occupy only about 20 acres of a 60-acre site, leaving about 40 acres of forested glacial beach ridge and swale habitat as a nature preserve. Voluntary preservation on this scale as part of a development is unprecedented in the area. The main community center at "Lake Huron Woods" and some residential units are being constructed in an area that required no fill of regulated wetland. This area was partially degraded by clearing and excavation decades ago. Residential units in the next phase are restricted to a few upland ridges near the community center, requiring minimal wetland fill for roads. Again, the upland ridge component is important, and wetland protection addresses only one dimension of the glacial beach ridge and swale habitat. However, in return, "Lake Huron Woods" will leave a continuous 40-acre natural area intact. Roger Myers is President and CEO of Presbyterian Villages of Michigan , based in Redford . He says, "As we began to understand the unique character of our site, beyond just the wetland, we sought to balance the development with the natural features". Roger adds that Presbyterian Villages of Michigan is a faith-based organization, and as such, it is important for them to serve the public good, encourage a higher quality of life in which the natural environment is complimentary, and to be socially accountable. Nature trails and possibly a nature center are planned for the site. In the summer of 2002, Eagle Scout candidate, Daniel Roberts, from Troop 178 in Port Huron Township , supervised the transplanting of hundreds of Purple-flowering Raspberry plants, a few Yellow Lady's-slipper plants, and other woodland wildflowers from the first phase development area to the preservation area. Presbyterian Villages has encouraged the Township and County to consider this land a catalyst for additional protection projects in the area.